For the first time, a powerful "wind" of molecules has been detected in a galaxy located 12 billion light-years away. Probing a time when the universe was less than 10 percent of its current age, University of Texas at Austin astronomer Justin Spilker's research sheds light on how the earliest galaxies regulated the birth of stars to keep from blowing themselves apart. 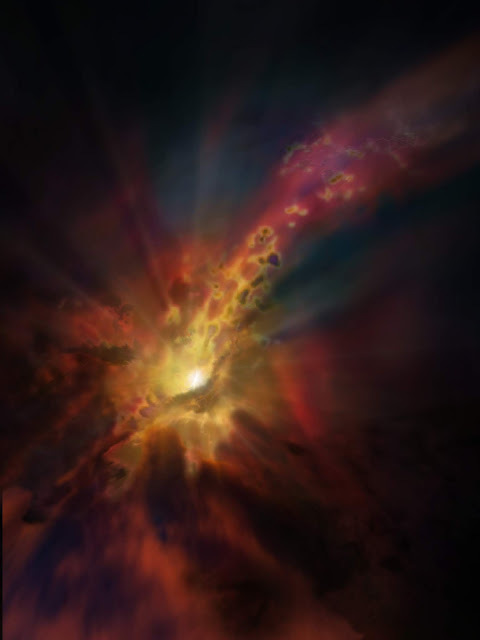 To avoid burning out in a short-lived blaze of glory, some galaxies throttle back their runaway starbirth by ejecting -- at least temporarily -- vast stores of gas into their expansive halos, where the gas either escapes entirely or slowly rains back in on the galaxy, triggering future bursts of star formation. Spilker's observations with the Atacama Large Millimeter/submillimeter Array (ALMA), show -- for the first time -- a powerful galactic wind of molecules in a galaxy seen when the universe was only 1 billion years old. This result provides insights into how certain galaxies in the early universe were able to self-regulate their growth so they could continue forming stars across cosmic time. The galaxy, known as SPT2319-55, is more than 12 billion light-years away. It was discovered by the National Science Foundation's South Pole Telescope. 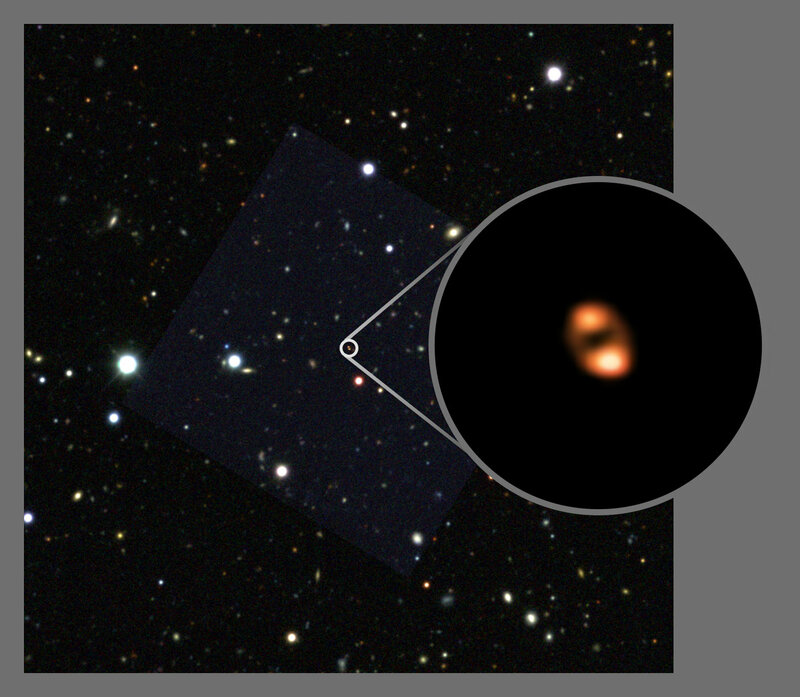 ALMA was able to observe this object at such tremendous distance with the aid of a gravitational lens provided by a different galaxy that sits almost exactly along the line of sight between Earth and SPT2319-55. Gravitational lensing -- the bending of light due to gravity -- magnifies the background galaxy to make it appear brighter, which allows the astronomers to observe it in more detail than they would otherwise be able to. Astronomers use specialized computer programs to unscramble the effects of gravitational lensing to reconstruct an accurate image of the more-distant object. The outflow was detected by the millimeter-wavelength signature of a molecule called hydroxyl (OH), which appeared as an absorption line: essentially, the shadow of an OH fingerprint in the galaxy's bright infrared light. "So far, we have only observed one galaxy at such a remarkable cosmic distance, but we'd like to know if winds like these are also present in other galaxies to see just how common they are," Spilker concluded. "If they occur in basically every galaxy, we know that molecular winds are both ubiquitous and also a really common way for galaxies to self-regulate their growth."